Wallets Marts Castle Douglas sold 105 Store Cattle, 25 OTM Cattle and 1353 Store and Breeding Sheep at their fortnightly sale on Monday 11th February 2019. Store Cattle met a good demand and looked dearer than the previous sale with numbers falling short of buyers requirements. Topping the sale at £1335 were a pen of Limousin bullocks from Messrs T Robb, Trolane, Dalry. Top price per kg for bullocks was 223.4 paid to H Templeton, Old Land for Limousin crosses. Heifers topped at £1290 for Limousin crosses from Trolane and 227p per kg for another pen of Limousin crosses from Trolane. Overall sale averages were 201p per kg for bullocks and 193.4p per kg for heifers. OTM Cattle were also dearer on the week topping at 138p for a Limousin cow from H & N Armstrong, Farhills and to £922.88 for a Limousin X from Upper Hardland. Sale average was 108.4p per kg. 1211 store hoggs were a flying trade topping at £86 for Texels from Messrs Shaw, Killochy, Balmaclellan. Due to high demand there will be a further sale in a fortnight on the 25th February – entries are readily invited. 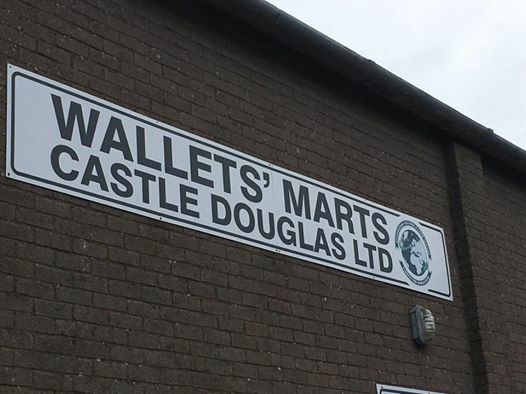 Wallets Marts Castle Douglas Limited on Tuesday 12th February 2019 had forward 1921 prime and cast sheep. 1438 prime hoggs sold to average 188.78 SQQ (194.66). Hoggs again a steady trade, lightweights would look sharper on the week. Top today was £107 for export weight Beltex hoggs from Craigview, Springholm, top per kg was 258.31 for an outstanding pen of Beltex from Torhousekie, Wigtown. A larger show of 375 Blackface hoggets sold to £83 for heavies from Barlure Farms, New Luce with a lightweight pen selling to 205.7 also from Barlure Farms, New Luce. A Larger show of 483 cast sheep would see Texel ewes sharper and lean ewes with best Blackface and Scotch Mules similar, top was £115.50 for Beltex from Torhousekie, Mules sold to £69.50 from Galtway, Blackface sold to £56.50 x 2 firstly from Kenmure, Dunscore then from Knocksheen.